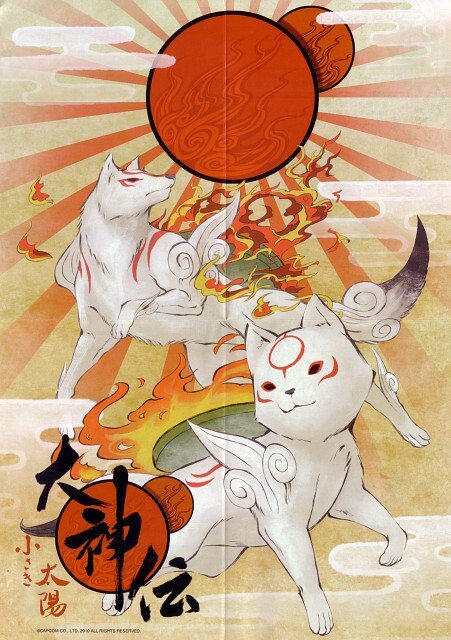 Okamiden follows the adventures of Chibiterasu, the son of the wolf/goddess Amaterasu. 8 months after the defeat of the eight-headed snake demon, Yamata no Orochi, Issun notices a new dark force at work in the land. Amaterasu has returned to her world in the sky, but Issun finds Chibiterasu, a young wolf pup with the same orange markings as Amaterasu, and convinces him to help save the world. Along the way, Chibiterasu is joined by a number of allies including Kuninushi, a young would-be warrior, Nanami the mermaid, Kagura the actress, Clow from the moon, and the fiery-headed Manpuku. Together they fight to keep Akurou-ou (the Lord of the Evil Way) from plunging the world into darkness. Having little exposure to the world of Okami outside of its artwork, I came to the DS game with few expectations. In all, I really enjoyed the game. I wish it was longer, since it felt like the ending was rushed, and some more time to explore the world would have been welcome. The story is not too interesting on its own, but the rich cast of characters draws you into the world and brings a lot of depth. The artwork and music help immerse you in this fable-like classical Japanese world, and are really quite good given the DS limitations. Okamiden is focused more on puzzle-solving than on fighting, making it more adventure than action. This is great for someone like me who has played all four Professor Layton games and is considering getting a 3DS just to play the fifth.